IAMBRIGITTE : The -BER months are here! 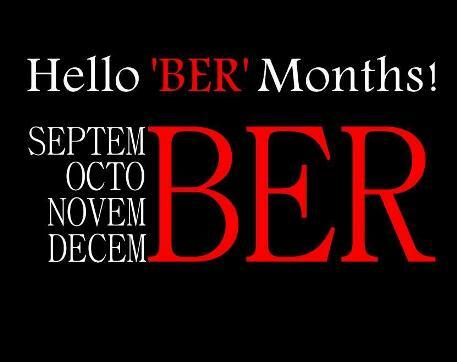 The -BER months are here! Homaygad, it's September 1st! And this means, Christmas is just around the corner! I know it's still months away but this day marks the beginning of the Christmas countdown, most especially for Pinoys. If I'm in Pinas, I'd be hearing Christmas carols being played already. And perhaps, see Christmas decors being sold in stores. Geesh, how I miss those things. Except for Christmas and New Year, there's a lot of other celebrations to look forward to during -BER months: our wedding anniversary this September (still no idea what to get the hubby or what to do on the day itself), my lola's, aunt's and uncles' birthdays on September and October, our BF-GF anniversary on November (yes, we still celebrate it! Kesoooo!) and my sister's birthday on December. Shempre, there are also reunions and a lot of get-togethers during the holidays. Hay, if only I'd be able to go home for the coming holidays. Yes, there will be celebrations with friends here too, but nothing can beat Christmas and NY celebration in Pinas. I'm pretty sure my fellow kabayans would agree with me on that. As with everything, it's always better to start early. So that means, we need to start preparing for our Christmas wish list. Err, I mean our gift list! Too bad I can no longer use the "But I'm unemployed" excuse for this year. Hahaha! So for my godchildren, ninang will make bawi this year. If last year, I only sent you virtual hugs, this year there will be lots of virtual kisses as well! How about you, what are the things you are excited about these -BER months? By the way, if you want to keep track of the number of days left before Christmas, check out this link. You might want to set it as your homepage, so you'd get some sort of panic attack whenever you see it.